Pyracantha is a genus of thorny shrubs in the family, Rosaceae. Its a popular, evergreen plant used profusely for its ornamental value and practical attributes. Also known as Firethorn, a name which originates from the Greek translation of pyr being fire and akanthos meaning thorn, its exciting appearance coincides with the dramatic tone created by its common name. Famous for its berries, the varieties we offer boast an abundance of colourful fruits in fiery shades of red, yellow and orange. The berries appear in late summer, ripen in autumn and if left untouched, can remain until early spring. 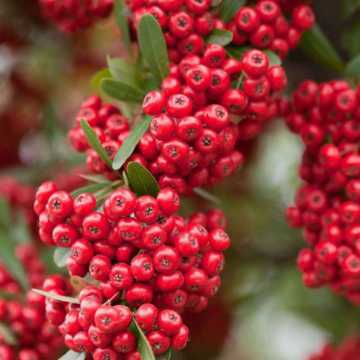 Pyracantha is perfect for planting as a single variety, but to truly utilise the awe of this ornamental shrub, plant as a mixture and come summer, receive a bounty of berries and a wonderful explosion of vibrant colours. The luscious berries come after a decorative display of pure, white flowers that emerge in spring. The flowers appear in large clusters, completely covering the lush, evergreen foliage to create a snowy white canvas. The flowers consist of small petals with bright yellow stamens and also produce a highly scented fragrance. The contributing presence created by the fantastic flowers and fruits, sees this plant frequently used throughout the show garden community as its used for its ability to intensify a gardens atmosphere and successfully draw attention to specific areas, making it the ideal focal feature. You can shape and trim Pyracantha to create formal appearance and bring structure to a garden, or leave to grow for a more natural, bushy look. 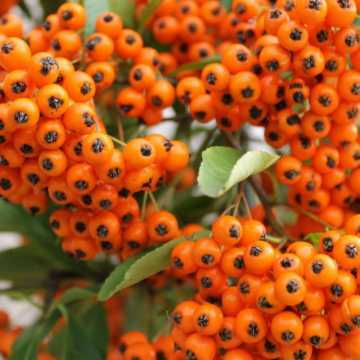 The practicality of Pyracantha partners its beauty, as it uses within a garden are plentiful. This species is one of our most popular, prickly hedge plants and is highly recommended for those wanting an intruder-proof barrier. Ideal for heights up to 3m, the dense structure of spiked branches makes this the ultimate, impenetrable, screening hedge with privatising, noise reducing and wind breaking abilities. It can also be trained as a climbing feature to add interest in the form of colour and texture, along walls and fences and can be positioned underneath windows to continue its intruder deterring capabilities. Its the perfect, wildlife friendly hedge! The colourful berries are an important source of food for an array of British garden birds, who also construct their nests among the thorny branches. Pyracantha flowers often dont get the recognition they deserve, but bees certainly love them. They provide a rich source of nectar for bees and other pollinating insects. Being evergreen, this plant plays an important role in the survival of garden wildlife as birds and other small garden critters use this plant as a safe and secure shelter during the winter. If you can get there before the birds, the eye catching berries can also be made into various jam, jelly, marmalade and sauce recipes. However, the berries mustnt be consumed raw! 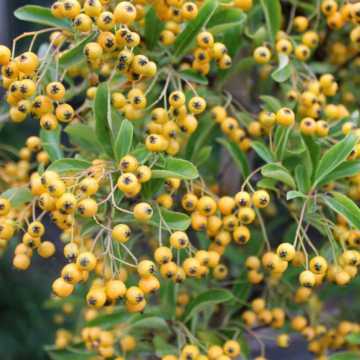 Suitable for inland sites, Pyracantha will thrive in normal soil, sun or partial shade. It has an average annual growth of 30-60cm and is therefore considered a low maintenance plant, but for upkeep of shape, a prune after flowering is advisable. Many of our most colourful hedging shrubs happen to be the most prickly! For example, our range of purple Berberis includes some of the most popular spiky plants for security whilst providing colourful, rich shades of red and purple foliage and particularly prickly branches! Other species include Holly (Ilex Aquifolium), Blackthorn (Prunus Spinosa), Dog Rose (Rosa Canina) and Gorse (Ulex Europaeus).